UPDATE: OCTOBER 2018 – The Tidy Living website appears to have gone offline. I’ve updated product links where applicable to direct you to where you can still purchase the items (or comparable items) highlighted in this post. 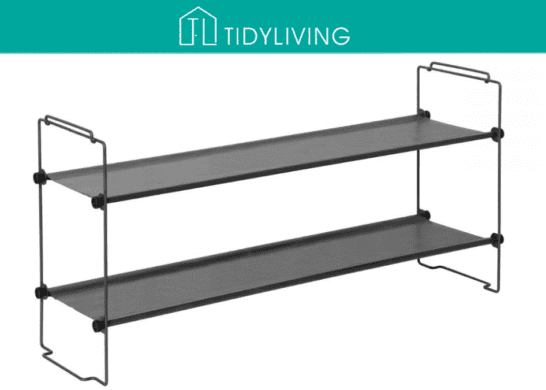 This post is brought to you in partnership with Tidy Living. 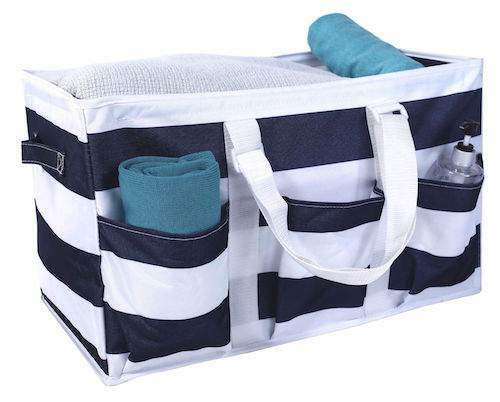 Although I received compensation and Tidy Living home organizing products, my very favorable opinions of the organizing products you’ll see below are 100% my own. This post contains affiliate links for your shopping convenience (which means if you make a purchase after clicking a link I will earn a small commission, but it won’t cost you a penny more)! Click here to read my full disclosure policy. Today, I’m super excited to introduce you to an awesome new online resource for affordable organization — Tidy Living! 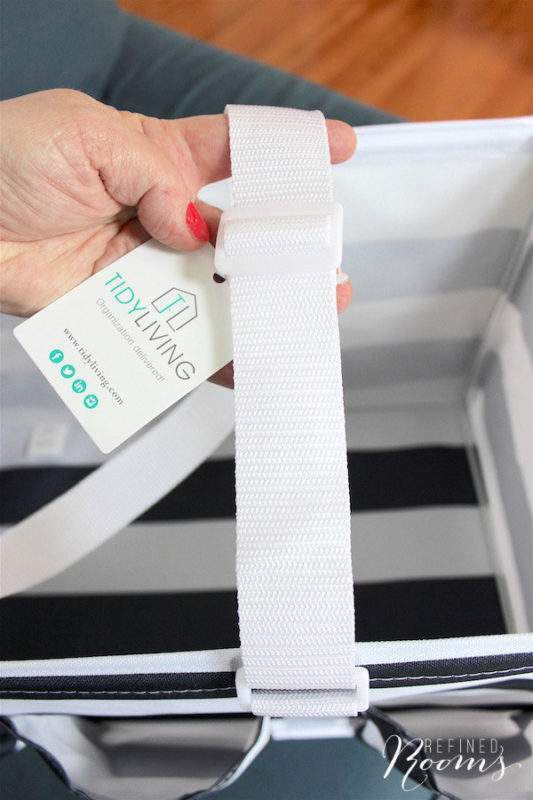 Even though they’ve been manufacturing amazing home organization products for over 10 years, Tidy Living only recently launched their online store (lucky for us!). 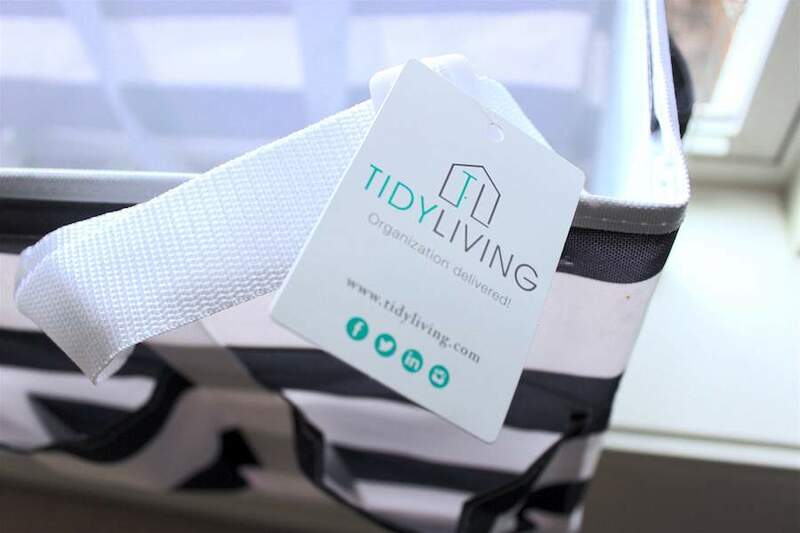 The folks at Tidy Living reached out and invited me to explore all that they have to offer. Once I took a look around, I was immediately smitten….and my wheels started to turn. You see, this spring, I’ve been on the hunt for storage and organization solutions for some current clutter hot buttons in my home. I’m happy to report that these “hot buttons” are no more, thanks to some super stylish storage products I found at Tidy Living. I can’t wait to share them all with you today!! Just be sure to stick around until the end of the post for a fun giveaway. If you’ve been hanging with me on the blog for awhile, you know that I spend a lot of my weekends hunkered down at local natatoriums watching my two competitive swimmer kids do their thing. Now, instead of the whole family headed to a single swim venue, there will be many times where Brian and I will need to divide and conquer to get each kid to a different meet in a different location…with their own set of swim meet essentials. 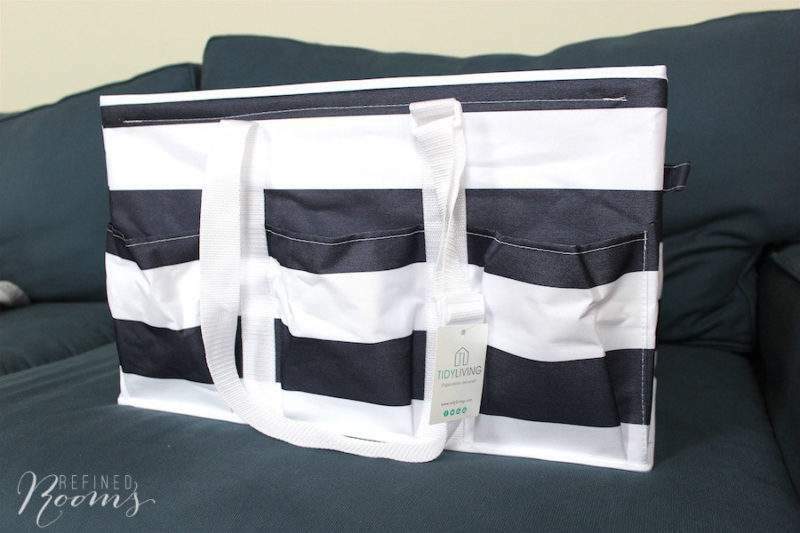 Imagine my excitement when I stumbled upon this cute rugby-striped utility tote, which sports the colors of my son’s new swim team! 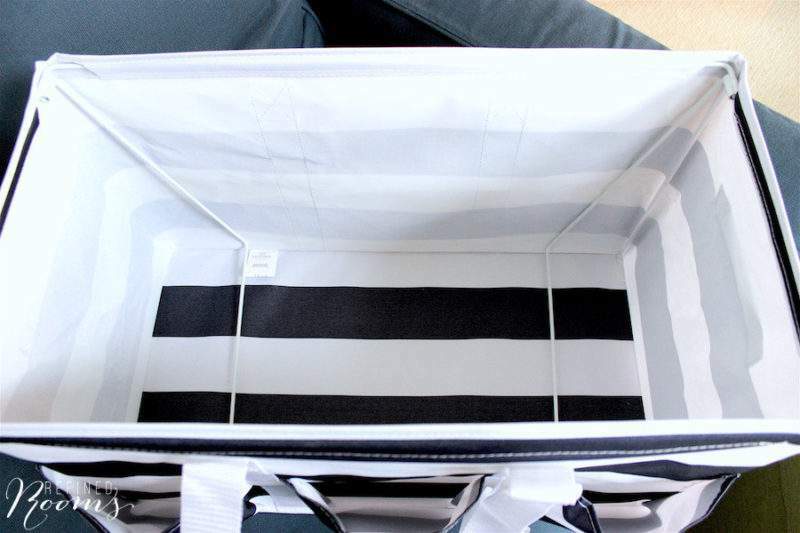 Did I mention that it also has three exterior compartments? My son will have easy access to his Sharpie pens that he uses to mark his meet event on his arms (yep. Swimmers do that). Count ’em. 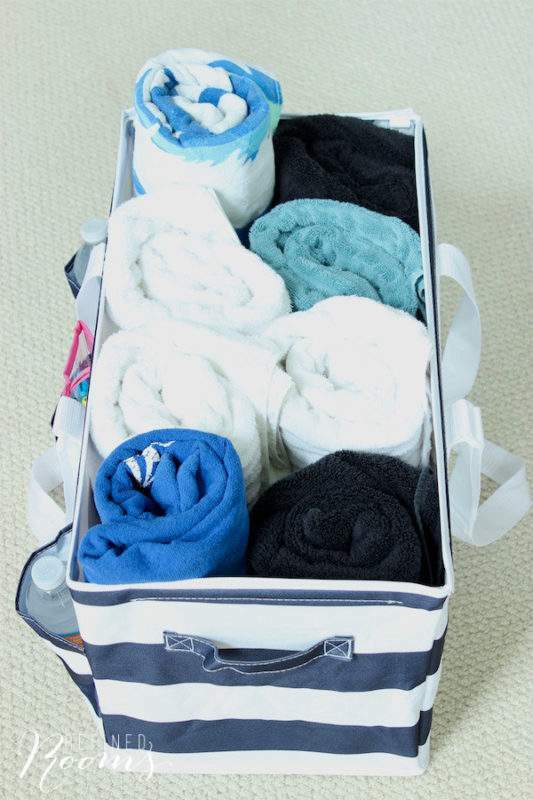 Eight towels. Crazy capacity…I know! 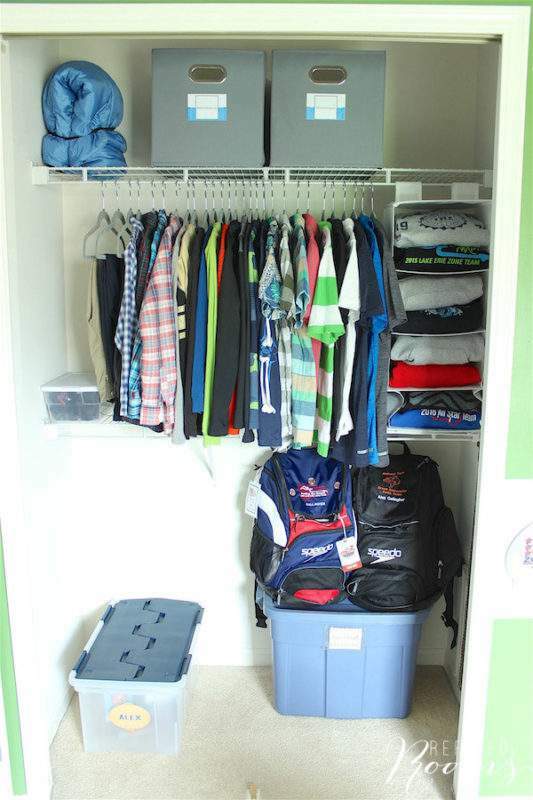 Speaking of my son, that brings us to organization hot button #2: my son’s bedroom closet. Poor Alex. 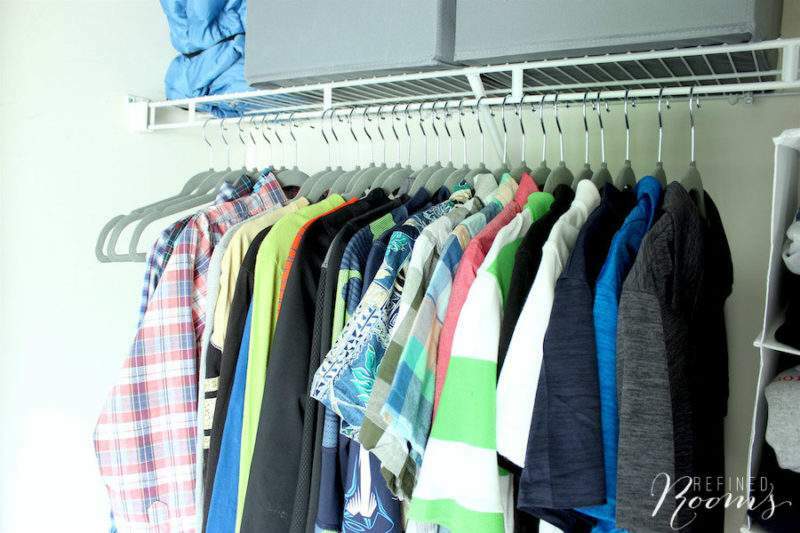 His is the last closet to receive an organizational overhaul. 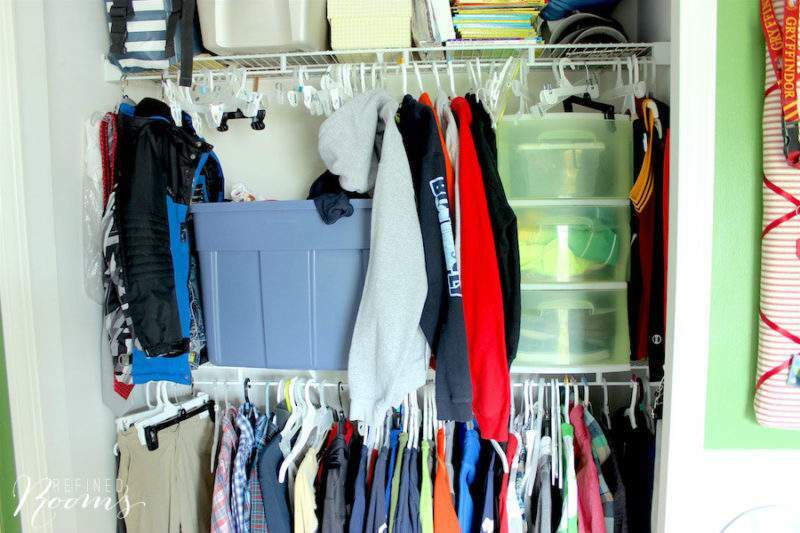 Now that I’ve tackled the closet in my daughter’s room and our guest room closet, I’ve run out of excuses for letting this closet clutter travesty continue for one more week. 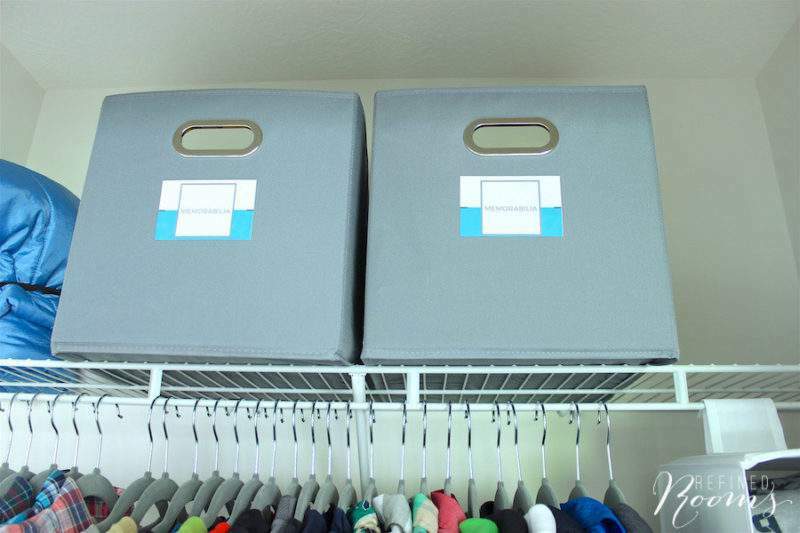 Related: Read why slim profile nonslip hangers are one of my Top 10 favorite organizing products. 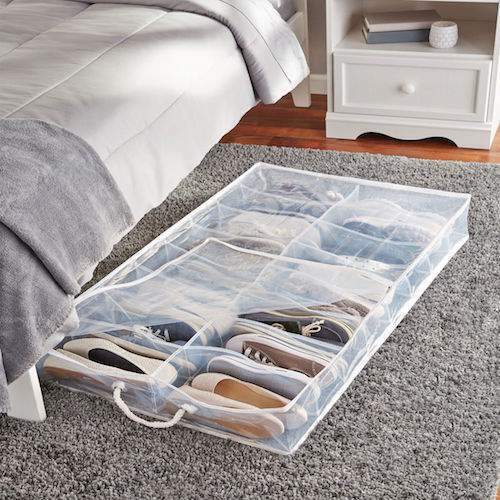 Enter this under-bed shoe organizer. 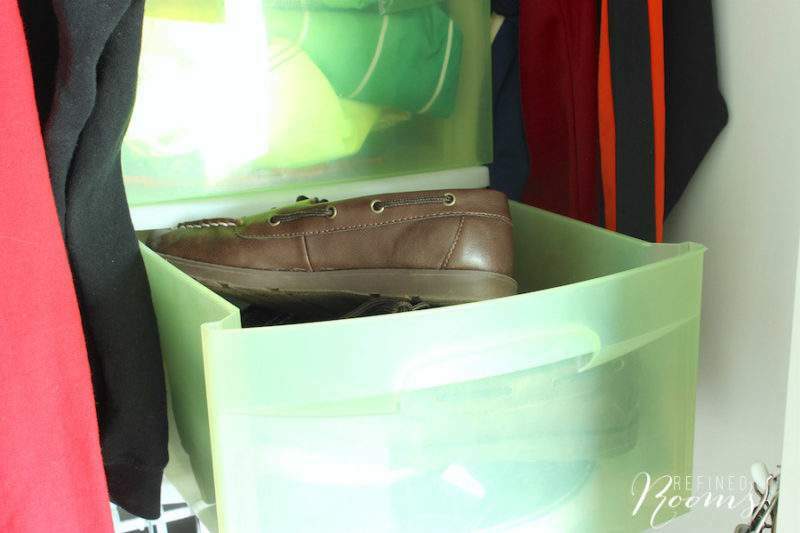 I decided to relocate those shoes (& boots shoved way in the back of the closet floor) and store them all under the bed using this handy storage product. 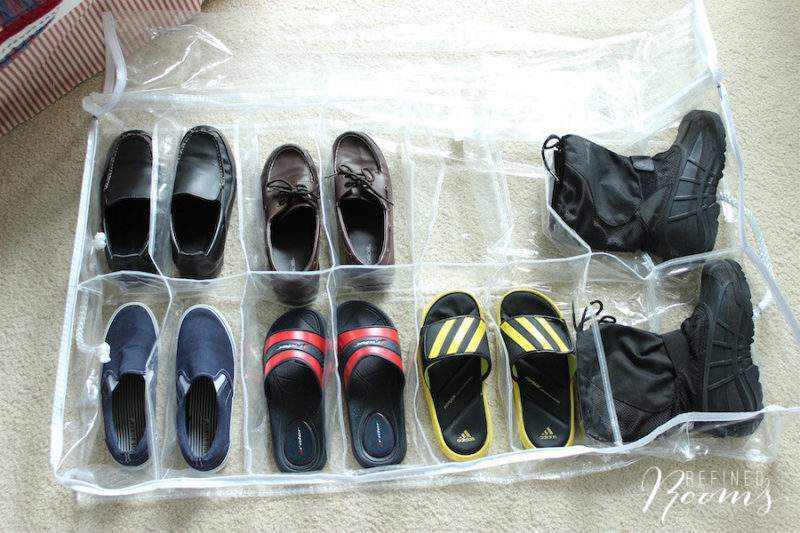 The little compartments keep the shoe pairs neatly together, and the cover keeps the dust at bay when the organizer is all zipped up. 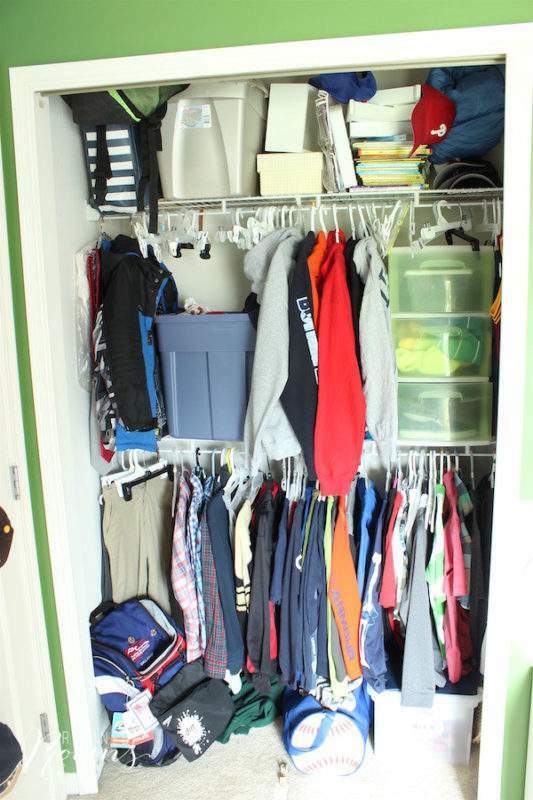 In the current closet set up, there was really no good place to store my son’s collection of hooded sweatshirts (he despised having to find space to hang them up on laundry day). 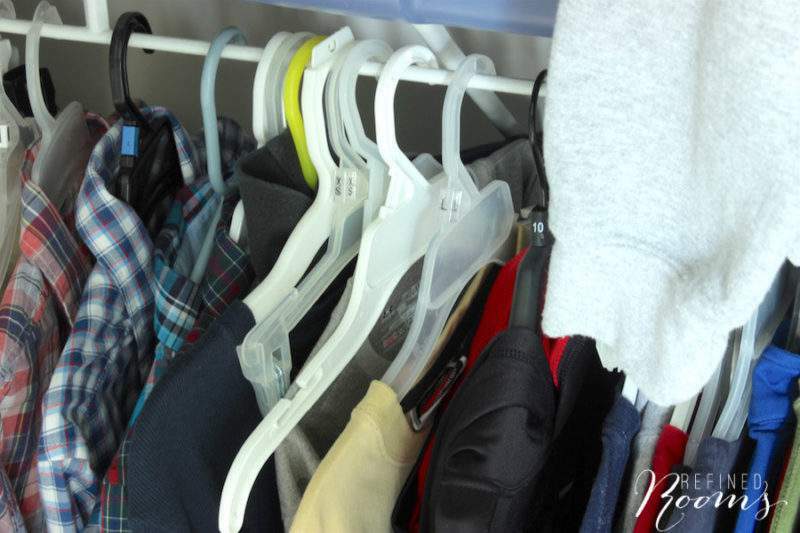 This new spot for hoodie storage is probably my favorite part of the closet organization makeover! 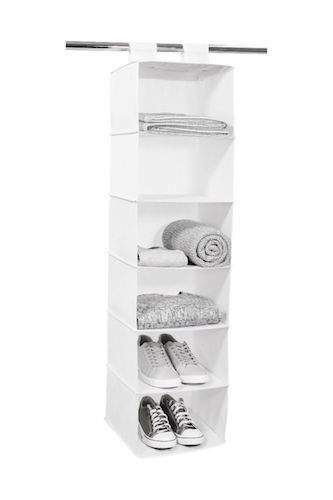 This 6-shelf hanging organizer is THE perfect solution for this clothing storage conundrum. 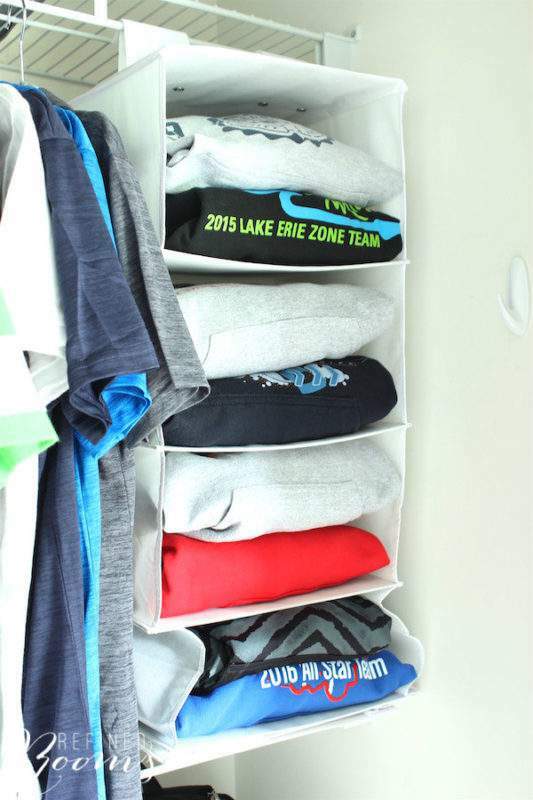 Although the current closet configuration only allows me to use four of the six available shelves in the organizer, it provides plenty of space to store all of those hoodies in a way that makes them easily accessible for my son to put away and take out. In the “Before” photo above, you may have noticed that jumble of random items that lived on the top shelf of Alex’s closet. The majority of those items fall into the category of childhood memorabilia. 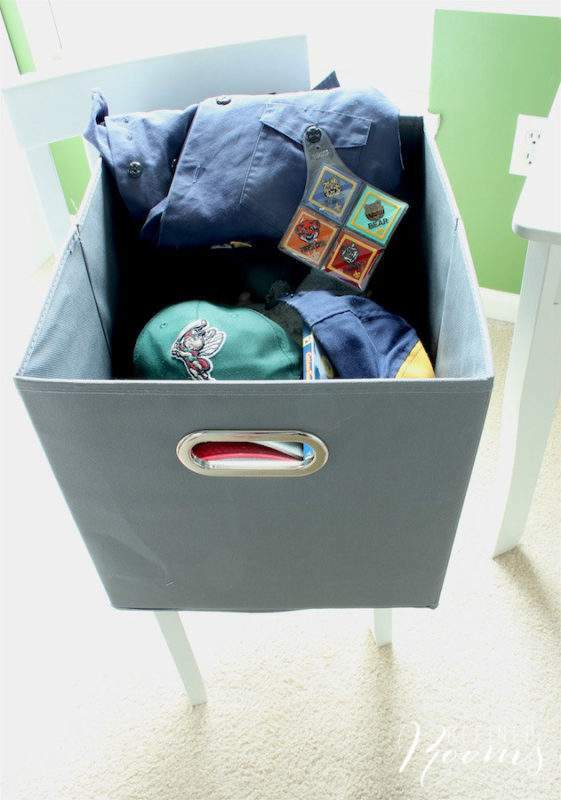 When I spotted these large fabric bins on Tidy Living’s site, I just knew they were the ideal solution for organizing these memorabilia items. These aren’t your ordinary fabric cubes. I’m really impressed by the sturdiness of these collapsable bins. And that decorative handle — it’s just so darn pretty! There you have it. Memorabilia clutter beautifully contained (with homemade labels, of course). 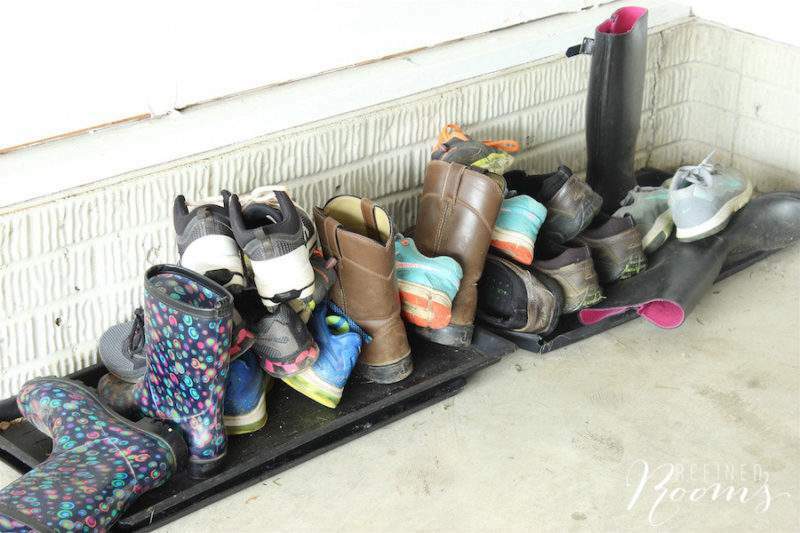 You know that collection of shoes and boots that your family stores in the garage because they’re just too grungy to live in the house? I’m guessing that just about every family has one of these collections. 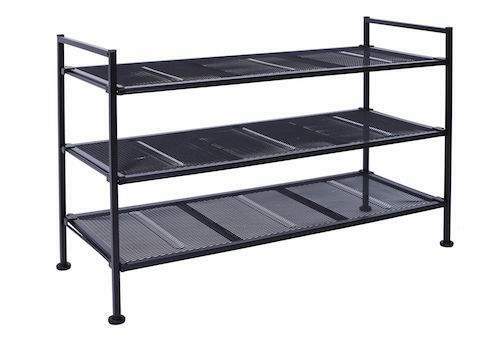 A total of zero tools was required to assemble these shoe racks (which took me all of three minutes). They are super sturdy, and made of material that will withstand garage conditions (think hot/cold weather and moisture). The best part? They are stackable and fully customizable. The removable shelves allow you to create a custom configuration based on the requirements of your specific space. Sweet! 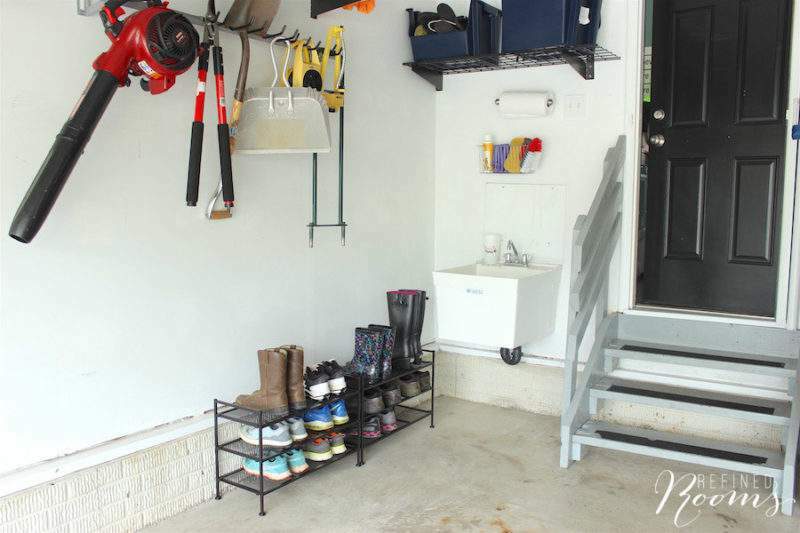 Now our little corner of the garage is no longer an embarrassment when guests enter our home through the garage door! 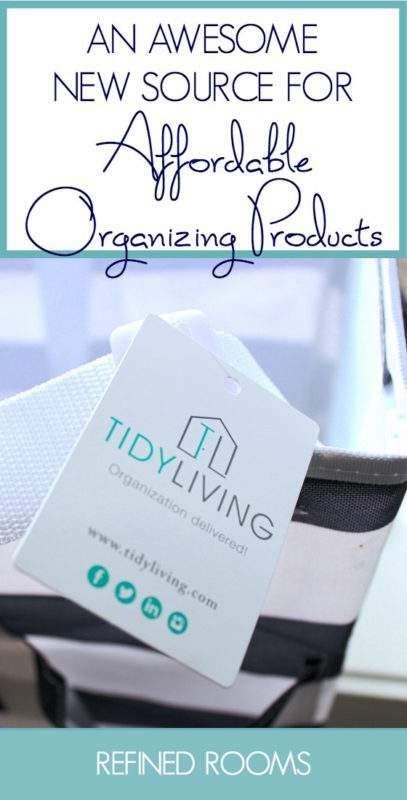 If you’re curious about any sourcing information for the awesome Tidy Living home organizing products featured in this post, I’ve included it all below. 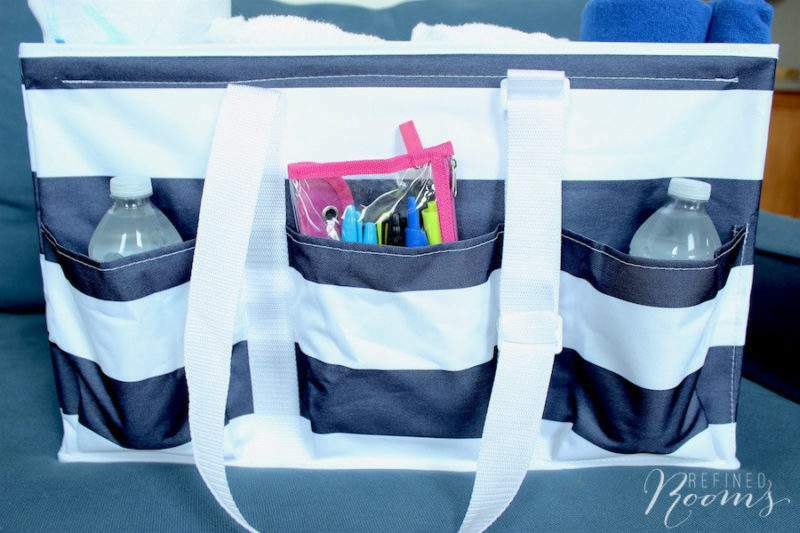 In order to help you tackle one of the organization hot spots in your own home, I’m hosting a fun Tidy Living giveaway! 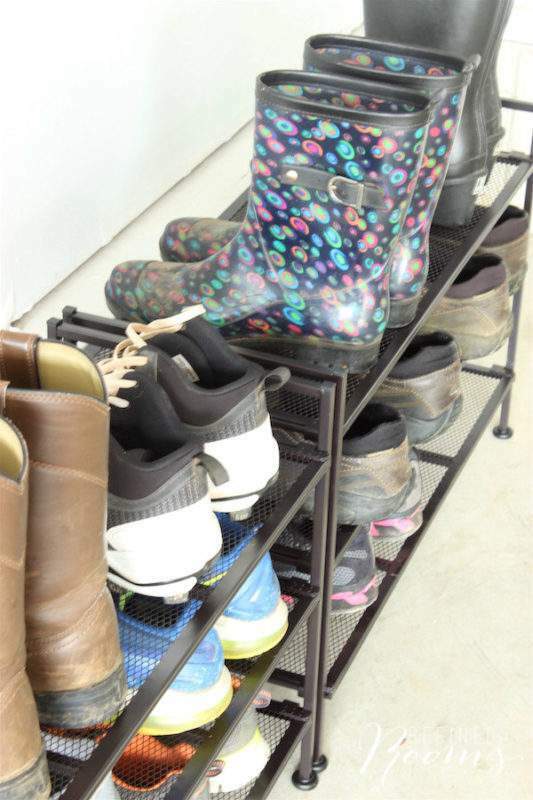 One lucky reader will win a stackable storage rack (pictured above) to help you corral those shoe piles that lurk in your home. Simply follow the instructions on the form below to enter. 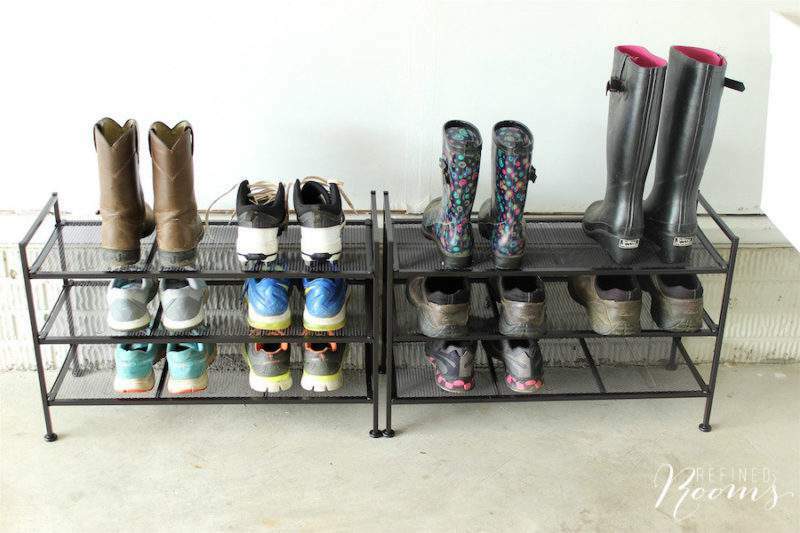 Note: this is NOT the shoe rack that I used in my garage (since that item is currently out-of-stock), but it’s very similar! Open to residents of the continental US who are 18 years of age and older. I wanted to know what type of label maker you use? Hey Shelley! I actually have multiples, but the one I used most often is the Brother P-Touch PT-D210 Label Maker. Happy Labeling! 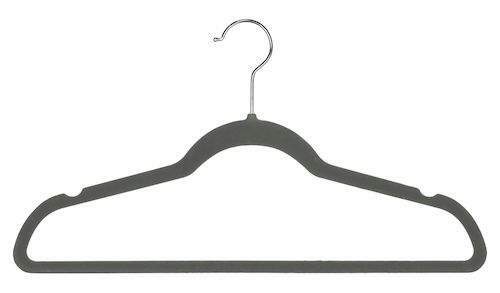 My daughter needs this for her closet, thank you for the giveaway. 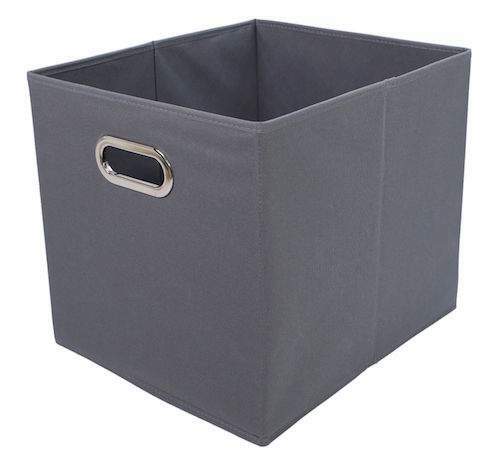 Yes, they are the “new kid on the block” for organizing and storage products. Not many people are familiar with them and that’s why I’m so excited to share this new resource!